They’re born with a selfish nature. Phrases like, “Feed me! Care for me! I’m the center of attention” are the rule rather than the exception. You’ll hear it from many different quarters these days: People are basically good and unselfish. It’s their environments that turn people’s hearts toward evil. Unfortunately, that theory just doesn’t square with what we see in human nature. If you’ve ever been around small children, you get this. They’re born with a selfish nature. Phrases like, “Feed me! Care for me! I’m the center of attention” are the rule rather than the exception. Human injustice throughout the world and in our own communities also shatters any misconception we have that we humans are all basically good. Left to our own devices, we oppress other people, hoard our food, and generally think about ourselves much more than anyone else. It’s as if God looks at the humanity he created and says, “OK, you think you’re basically good. You think human nature is basically unselfish? I’ll step back and let human nature take its course in the world. We’ll show you what happens when God isn’t in the picture.” Want to know what that looks like? Just pick up a newspaper. What’s true in children and society in general is also true in our lives today. You and I are treated unfairly all the time. But here’s a secret you may not have considered: You treat people unfairly from time to time as well. Our propensity to treat one another unfairly doesn’t surprise God. In fact, it shows why we need Jesus. 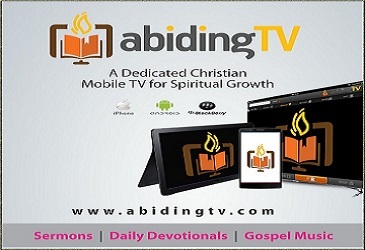 The Bible says, “God is letting the world go on its sinful way so that he can test mankind, and so that men themselves will see that they are no better than beasts” (Ecclesiastes 3:18 TLB). The reality is, without God in the situation, people are very inhumane to each other. That’s the heart of all the injustice and unfairness in our world — from despotic dictators to crushing poverty to simple injustices in our neighborhoods. One day God will judge every person on the planet for the injustices they commit against others. Because God is just, there must be consequences for how we treat others. That means we need mercy. All of us have been unfair with others from time to time. We’re not just the victims of injustice. We’re perpetrators, too. This unfairness shows us we need Jesus. God wouldn’t have needed to send his Son to die on the cross if people were generally good. The vast injustices in our world make it clear that humans can’t live moral lives on their own. Next time you’re treated unfairly, let it be a reminder: Every person on this planet, including you, needs Jesus. How do you typically deal with being treated unfairly? 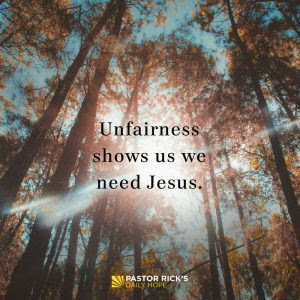 What do you think about the statement, “Next time you are unfair to someone, it shows how much you need Jesus”?